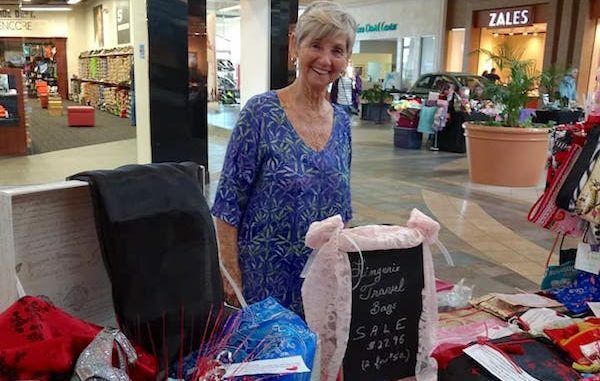 Pictured is vendor Judy Roberts. VERO BEACH – Join H.A.L.O. Animal Rescue at the Indian River Mall on Saturday, March 3rd 11:00 a.m. – 3:00 p.m. for a special craft show & adoption event featuring local artisans. An array of unique handcrafted items will be displayed by a wide variety of vendors. Petco is also sponsoring a very special animal adoption event. Be sure to stop by the H.A.L.O. Adoption Center in the Mall (near Sears and Victoria’s Secret) to visit with all the beautiful and deserving kittens, cats and dogs waiting for their furever home! Choose a rock from the beautifully painted “kindness” rocks donated by the “Indian River Rocks” painting group. And since this is an indoor event, there’s no worries about the weather. All the fun will be located in the common area of the Indian River Mall surrounding the H.A.L.O. Adoption Center. This event will be a great way to spend the day with your family and friends. Vendor opportunities remain available for new, handcrafted items. Showcase your talent to the community! H.A.L.O. is Indian River County’s only no-kill, non-profit animal rescue and adoption center. For more information, please contact H.A.L.O. No Kill Rescue Adoption Center at the Indian River Mall at 772-778- 8798 or email [email protected].